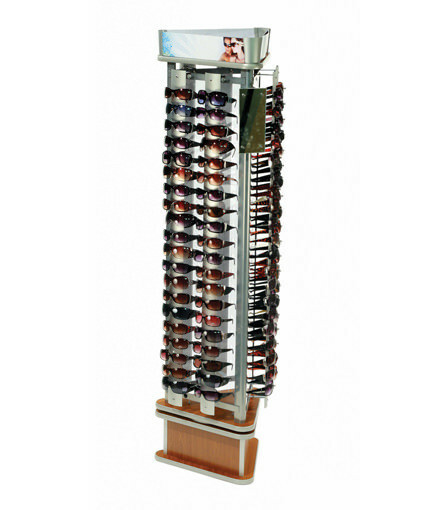 Our spinning retail sunglass display holds 144 glasses and features custom black plastic extrusions, frosted PVC panels, 2 acrylic mirrors, wire sunglass holders, and a black MDF spinning base and top. 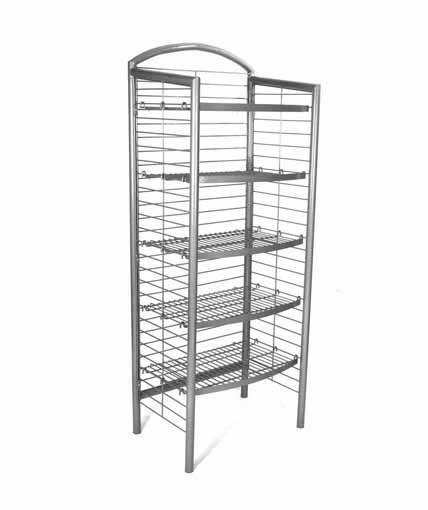 This high-capacity eyewear rack utilizes a knock-down design which is cost-effective for shipping and storage. Unlike other sunglass display fixtures on the market, the SU-FL144 converts to a multi-product retail display by substituting pegboard panels on 1 or more sides. The SU-FL144 is more than just your typical retail eyewear display. 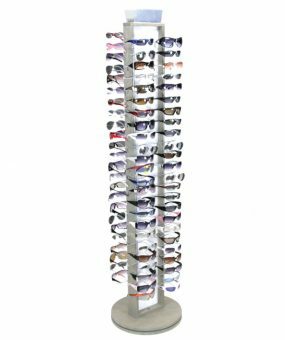 If you are only looking to merchandise sunglasses or reading glasses and need a spinning floor display that holds a lot of product, the SU-FL144 is an excellent choice. However, the merchandising range of this unit extends far beyond the eyewear category. The frosted PVC back panels can easily be interchanged with pegboard panels and the wire sunglass holders can be removed and stored for later use. Alternatively, you can order this fixture with as many pegboard sides as you like instead of the sunglass component parts. Many of our customers order this display with 3 sides configured for sunglasses and the fourth side configured for sunglass accessories such as lanyards. Other customers use the pegboard panels on 1 or more sides to cross-merchandise related accessory products. Virtually any peggable product can be displayed on the pegboard panels. 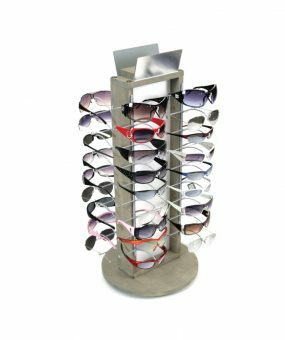 Still other customers will utilize all 4 sides for sunglasses during the high season, and then convert it to a pegboard display to sell other products during the off-season. The SU-FL144 is particularly popular for use in dollar stores, drug stores, sporting good stores, and other larger format stores with high traffic. 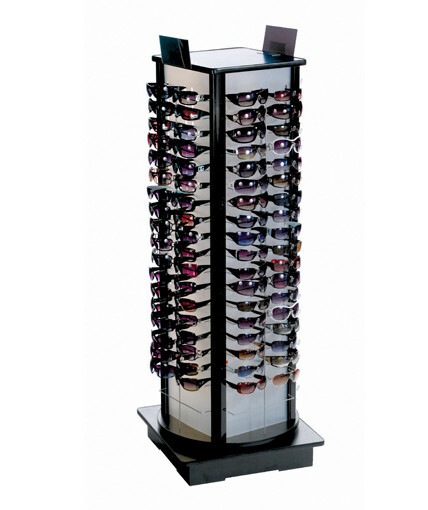 Easy to merchandise and service, this sunglass floor display is a sure bet to increase your eyewear sales. It also can provide an effective way to cross-merchandise complementary products when converted to a multi-product merchandiser, thereby driving higher overall sales.